​When we started this little podcasting adventure, it was just Linzi and Chris…talking about their mutual love of podcasts and how much they would like to make one of their own. What bloomed from there was the beginning of GeekEnd Cast. Our flagship podcast, Ctrl+C started out as five friends who wanted to watch movies and talk about them together. We've even expanded our team to include the Gaming Dad 101 podcast in which Chris, Brian, and Ricky discuss gaming and parenting. Sure, there are hundreds of podcasts just like this, but Ctrl+C was our little friendship baby birthed from a love of each other and a love of movies. In case you aren't already aware, since there were five of us coordinating schedules got a little iffy. We only met once a month and did a marathon recording session. Towards the beginning of everything, we met Billy. A friend of Ray's whose personality fit well with ours and provided a much needed additional perspective to our sessions. We went along, as friends do, recording as often as we could. Along the way life happened. Birthdays came and went and we celebrated together. About midway through last year, Teresa made the decision to step away from the podcast to spend more time with her family. We never really addressed it on the show because we thought she would be coming back. Life is funny sometimes and things don't always work out the way that we think that they will. That being said, Teresa made the decision not to return to the show in a more permanent fashion. While we are saddened by her decision, we understand and support it and wish her the best of luck in her future endeavors. Ctrl+C is still going strong and we look forward to entertaining you for a long time to come. There have been plenty of classic eighties comedies that I have not been able to enjoy. Over the years I've heard how amazing some of the classics are and I'm sure they are great, for you. So many of our childhood movies are wrapped in nostalgia that it's sometimes difficult to separate the things we loved about them from the actual quality of the movie. Of course all movies are subjective but there are some that are just bad. I'm incredibly glad that Adventures in Babysitting was not one of them. It was Teresa's pick this week but it turned out to be one of Ray's favorite movies as well. He even still had the VHS of the movie on hand at home. I personally really enjoyed this movie and despite the fashion an vehicles, overall it still holds up from three decades ago. The jokes were sometimes subtle but definitely on point. It had that sarcastic flair that comedies of the time were just starting to explore. If you're unfamiliar with the movie, it stars Elizabeth Shue as a babysitter whose night goes terribly wrong when she has to go into the city to pick up a friend. She takes the kids she's babysitting with her and they end up in multiple dangerous and hilarious situations. This week we watched Why Him? The movie stars James Franco, Bryan Cranston, Megan Mullally, and many others. The story centers around Cranston's character learning to deal with his daughter's new boyfriend played by Franco. The family travels to California to spend the holidays with their daughter and is surprised to learn that they will be staying at the boyfriend's expansive home instead of the hotel. From there, hilarity ensues. I enjoyed the movie overall and I laughed a lot. Franco plays the role the way he plays everything. It's a slightly off-kilter version of himself that he portrays in every movie he's in. This is fine with me, I enjoy his work. I'll tell you now though, that if you don't like Franco, you'll probably be annoyed with this movie. After all this time, there's still one thing that's bugging me about the daughter. She changed her parent's travel plans on a whim and failed to tell them. She lied about having a boyfriend, about how serious they were, decided to make all sorts of major life decisions…and then just expected that everyone kowtow to her and just be OK and accepting of it. She knows these things will upset her family and she simply doesn't care. She bats her eyelashes at her Dad and then gets upset when he needs time to process everything. Thank goodness the movie was more about Franco and Cranston than it was about the daughter, otherwise I wouldn't have made it through. Despite that annoyance, I think it's worth a watch. It's a rainy day movie. Evil Dead. Man oh man, I am glad to be done with these movies. We are wrapping up our summer series this week in which we’ve reviewed the Evil Dead series including Evil Dead 2, Army of Darkness, and this week’s episode, the remake from 2013. This was my third time seeing the recent version of this movie and I was already disillusioned with it. There’s only so many times that I can see the same blood and gore. I don’t typically enjoy horror movies as a genre. I’ve never understood the appeal of it. There have been plenty of incredibly campy ones that I’ve been able to laugh at (Tucker and Dale vs. 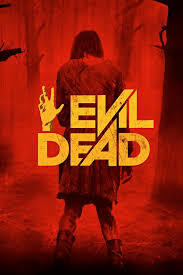 Evil) and even the original Evil Dead movies. This remake was different. I could find no camp. Just creepiness and a whole lot of blood. A metric ton of blood. Cabin in the Woods blood coated walls level madness. The chainsaw is back, the familiar tropes are back, the cabin in the woods is back. The differences in this one make it unique. The main premise is that these people have all gathered in this cabin to help a girl so through her withdrawals. There’s a sad backstory that gets glossed over and a lot of “no don’t do that” happening. The acting is relatively decent here, there are a few TV actors you may recognize. Overall it’s creepy and gory and an incredibly good remake of the original. That likely had a lot to do with the original producers coming back for this round. I’ll be alright if I never see another one of these movies though. The podcast covers all this and much much more. The entire team sat down to discuss our thoughts on the subject. Take a listen and let us know what you think. We finally managed to get to the theater and see Wonder Woman this weekend. We ended up having to wait because T was on vacation for opening weekend. Saturday we ended up breaking from our usual schedule and recorded an episode first. Then we went to the theater and recorded the Wonder Woman episode. We've never done it like that before and it definitely took a ton of time out of the day. We had done the reserved seating in the local theater so that we wouldn't have to worry about finding six seats in the same area. We have a tendency to run everything down to the last minute as a group and I definitely did not want to have to be scrambling for space. When we got into the theater, the previews were playing but there was no picture. The movie ended up delayed because of technical difficulties. Once the movie got started though, I knew I was in trouble. I maintained a low level of teariness throughout most of the movie. From the moment the score began in the opening credits until the ending credits began. I never outright cried, but I came close. Confession? I never was the biggest Wonder Woman fan. I always felt like I was supposed to be, but it didn't resonate with me like it did for Teresa or countless other folks like her. I was always drawn more towards Batman and Superman and truth be told, I didn't really even know very much about her. Over the last ten years or so, that has gradually changed but growing up I had no frame of reference for her. I also had not seen Gal Gadot perform as Wonder Woman because I've yet to see Batman v Superman. I have read up on the character extensively. One of my favorite characters from her cannon is Donna Troy and I really hope they bring her around at some point. I'll tell you now that the movie was amazing. For more, of course, you'll have to take a listen to our podcast which I've left a copy of above. But overall it wasn't just a great Wonder Woman movie, it was a great movie. It completely transported me to her world and I wanted to live in it with her. Highly recommend you see the movie if you haven't already. If you have, take a listen to the podcast for our thoughts. Did you feel the same way we did? Did we forget something? Let us know in the comments.